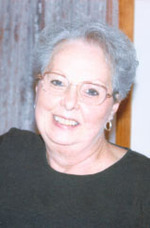 Charlotte A. Schuerman, age 74, of Woodsfield, Ohio died Wednesday April 25, 2012 at her home. She was born in Woodsfield November 20, 1937 a daughter of the late Hugh and Laura Bauman Walter. Charlotte was a 1955 graduate of Woodsfield High School and graduated from Belmont Technical College in 1974 as a licensed Practical Nurse. She was a member of St. Paul’s United Church of Christ where she was a member of the Church Choir. She was a member of the Happy Heart singers, Monroe Singers and several other singing groups. She was also very active in the Woodsfield High School Alumni Band and Choir and was an avid Woodsfield Redskin and Seminole fan. She is survived by two sons; Rick (Teresa) Schuerman and Dave (Janet) Schuerman both of Woodsfield, two sisters; Corrine Billman of Woodsfield, and Joanne Oehler of Columbus, three grandchildren; Elizabeth, Jacob and Sydney Schuerman, and several nieces and nephews. Friends received from 2 – 8 p.m. Friday at the Bauer-Turner Funeral Home 100 S. Paul St. Woodsfield, Ohio. Funeral Services will be held at 11 a.m. Saturday April 28, 2012 at St. Paul’s United Church of Christ Woodsfield with Rev. Frank Lehosky officiating. Interment in the Oaklawn Cemetery Woodsfield. Memorial contributions may be made to; St. Paul’s Memorial Fund, 303 S. Main St. Woodsfield, Ohio 43793, Cancer Gas Cards c/o Shirley Brown,48397Keylor Hill Road, Woodsfield, Ohio and or the Woodsfield High School Alumni Association.